Explanation: What that bright red spot between the Lagoon and Trifid Nebulas? Mars. This gorgeous color deep-sky photograph captured the red planet passing between the two notable nebulas -- cataloged by the 18th century cosmic registrar Charles Messier as M8 and M20. M20 (upper right of center), the Trifid Nebula, presents a striking contrast in red/blue colors and dark dust lanes. 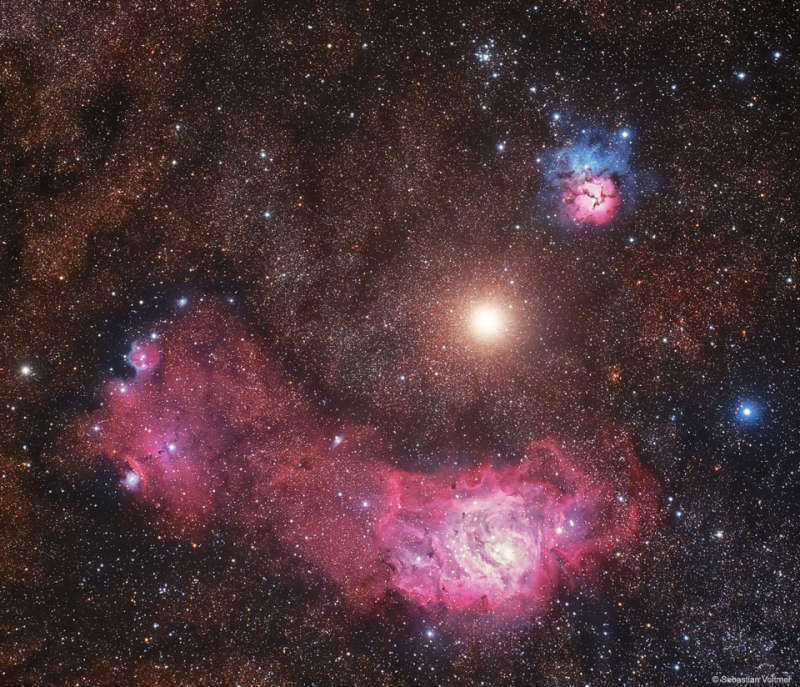 Across the bottom right is the expansive, alluring red glow of M8, the Lagoon Nebula. Both nebulae are a few thousand light-years distant. By comparison, temporarily situated between them both, is the dominant "local" celestial beacon Mars. Taken last week, the red planet was only about 10 light-minutes away.